Your personal values are essential. They set your moral compass. They guide your behavior when you are under the stresses of life. Most people have not clearly articulated their personal values, and we strongly encourage you to do so. Recently, someone contacted us with questions about developing her personal values. She had difficulty selecting three to six values, as we recommend, and further wondered if it is advisable to have separate personal values versus work values. Yes, most people have more than three to six values that are important to them. The problem is remembering them, especially when the pressure is on. That’s why we recommend three to six values with an acronym for memorability. One can then take other values and use them in the explanations for the three to six core values. I choose to lead at times and follow others at times. Leadership is a responsibility to step up, be accountable, listen, debate constructively, and make decisions for the best interests of the group, getting beyond my self-interest and ego to help people achieve extraordinary accomplishments. Deep, meaningful, caring connections with my network of family, friends, and colleagues are vitally important to me. I believe in the capabilities of people and have faith that we can work well together in trusting collaboration. 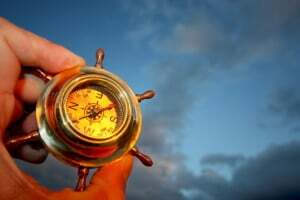 My moral compass is set and based on ethical actions, honesty, honor, kindness, spirituality, and leading an integrated life, in which I am the same authentic person in all facets of my life. I will meet life’s trials bravely, facing my fears and moving through them with quiet fortitude, resisting the negative pressures and temptations of the world, even as a solitary voice of one. My purpose is to leave people in the world in a better place, creating value for them and with them, treating them with respect and dignity, and helping them find the inherent love, happiness, beauty, and joy in life. Bob might not, when the pressure is on, remember all the words in the explanations, but he can’t forget his acronym (LRICS) and what each of those letters stands for. It’s his moral compass. We don’t believe one should have a different set of values for one’s personal versus professional life. Our challenge is to lead an integrated life in which we are the same person everywhere. The shared values of a team or organization should emerge from the personal values of the team members that they have shared with each other. The group values will not be identical to your personal values, but they must be compatible with your personal values. Otherwise, there will be dysfunction, stress, and discord. People often don’t leave jobs; they leave bosses or groups where the values are inconsistent. Keep your core values to six or fewer to ensure they are memorable—and thus accessible when needed. Use descriptions to clarify them and unearth their richness, potentially including references to other related values. Let us know if you have other suggestions for setting your personal values. We’d love to hear them. 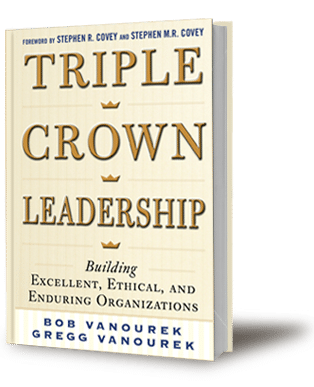 Bob Vanourek and Gregg Vanourek, father and son, are co-authors of and speakers on Triple Crown Leadership: Building Excellent, Ethical, and Enduring Organizations, a winner of the 2013 International Book Award (Business: General). Sign up on our website to receive email notifications of our leadership blogs.